We do well to draw a sharp line between the subjectivity of religious experience and the objectivity of a congregational, corporate life together. Where I get my personal religious jolt is up to me—Hinduism, Christianity, Buddhism, paganism, pantheism, atheism, all of the above . . . Up to me. DIY. Where I find my meaning is up to me. Where I go for my religious, corporate, home is up to us. For those who will be following Moore’s advice on DIY religion, one of the best homes is a Unitarian Universalist congregation . . . If . . . we can awaken to how big the tent must be. This is the wisdom of the idea of covenant embedded so deeply in Unitarian tradition. “We need not think alike to live alike,” is the sentiment, even if no one famous ever actually said it. Breeden makes a good case for widening the tent, recognizing that as the more narrowly-defined mainline churches are declining, we have an opportunity (using his metaphor) to be the craft brewery in a sea of Budweiser. We should be, can be, must be the big tent of belief. Our third and fourth principles (acceptance of one another and encouragement to spiritual growth in our congregations, and a free and responsible search for truth and meaning) demand it. And we have an opportunity as a non-creedal religion to make that tent as large as the world. And he even is clear that we’re not talking about congregational life, but rather individual spiritual growth. As I read his post, Breeden seems to have forgotten the lessons we learned from Tim Taylor. 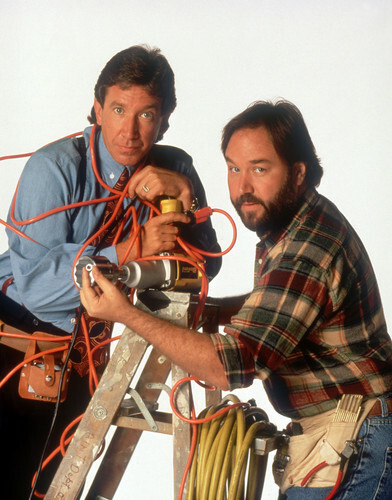 The television show Home Improvement featured actor/comedian Tim Allen as the host of a DIY show called “Tool Time” – an expert on DIY, except an incompetent one. The running gag throughout the series was that Tim was constantly at the ER for various accidents, was always messing up a DIY project at his home, and relied heavily on the calmer expertise of his sidekick Norm. Without Norm, all hell would indeed break loose (and often did, to great comic result). But amid the laughter, we saw Tim waste precious time and resources on ill-advised projects taken up without good support, guidance, or the right tools. And that is the danger I see in the DIY model of religion. I should know. I was a DIYer for a long time. Throughout my 20s and most of my 30s, I did it myself. I read books, I tried my hand at spiritual practices, I attempted to find communities of likeminded people to conduct rituals with, but my actual religious life was a mess. Even in those early years of attending a UU congregation, I was there mostly for the LGBTQ activism and the music. I was a DIYer, and I knew my path. Except I didn’t. Contradictions abounded in my beliefs, in my practices. I felt constantly adrift, always looking for the next cool thing to feed my spirituality. And then I began attending a UU congregation whose minister actually cared about our spiritual growth as well as our personal growth. Her gentle and calm expertise helped me, and others in our congregation, find and explore our spiritual paths responsibly and with great care. As a result, I stopped drifting and seeking aimlessly, and I began to not only understand my beliefs (which, as it turns out, is Universalism on a bed of Process Theology, seasoned with Paganism and a bit of Christianity on the side), but finally stop long enough to hear the call to ministry. Breeden is right in that we have – or at least should have – a tent big enough for the wideness of spiritual understanding. But we should not be a place where folks wander aimlessly through the aisles hoping the right screw or angle brace jumps out at us. We should not be a place where a towering wall of microbrews beg for our attention with catchy names and striking labels. Let us instead be a place where each person is calmly and gently welcomed and guided by those who have been on the path before us and know the way. Just as home improvement stores hold classes and have experts on hand, so should we – courses like Building Your Own Theology and Wellspring Spiritual Deepening, along with good spiritual direction, make all the difference. That is why we are a religion and not a collection of people who like some of the same things. Not because we believe the same things, but because we travel together with knowledge and the same kind of seeking hearts. Our tent is big, but our tent should contain experts and signs and guides and companions so that we don’t have to just do it all ourselves.